New Project in the Microbiology of the Built Environment: Jordan Peccia – microBEnet: the microbiology of the Built Environment network. There exists a significant gap in our understanding of how the building environment mediates human exposure to bacterial and fungal diversity. The purpose of this research project is to determine how building moisture influences fungal and bacterial ecology in house dust. We will produce quantitative microbial diversity measurements for dust collected from 200 homes located in the northeastern U.S. Next generation DNA sequencing and real-time PCR analyses will be applied to produce bacterial and fungal concentrations and quantitative bacterial and fungal taxonomic libraries from 200 archived dust samples. These samples were collected during a 2007 to 2012 NIH asthma-epidemiology research project and each home sample contains a comprehensive catalog of metadata including dampness and visible mold observations, building characteristics, and occupant health status. To determine how qualitative moisture indicators impact fungal and bacterial microbial diversity, bacterial and fungal a and b diversity measurements will be statistically associated with the presence of water damage or visible mold. Specifically, analyses will investigate the influence of moisture on diversity metrics, determine whether dust samples from homes with water damage or visible mold have a unique microbial signature, and identify specific bacterial or fungal taxa that are associated with moisture and asthma exacerbation. Species diversity within abundant genera and classes will also be investigated. The study described here will identify microbial diversity characteristics as well as bacterial and fungal taxa that are associated with water damage and visible mold in homes. Given the large number of homes and the large set of metadata, we expected to define a microbial “fingerprint” of moisture damaged buildings. 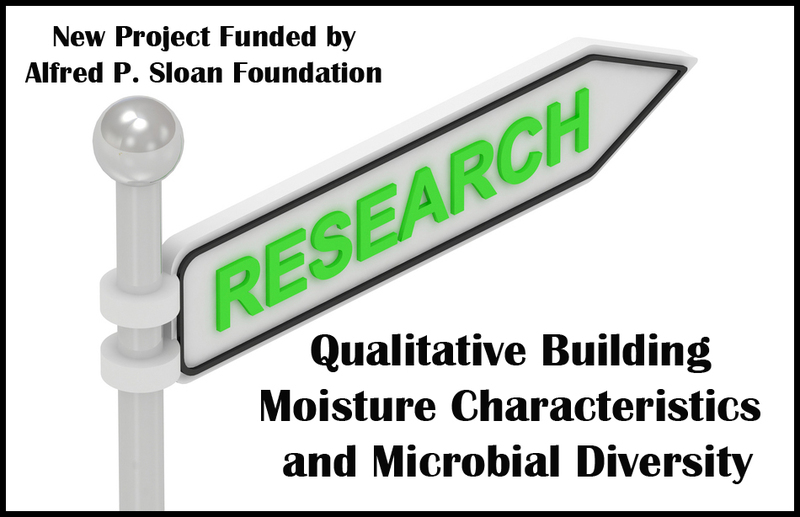 The project also contributes broadly to the Sloan Foundation’s Indoor Microbiome Program by defining a robust statistical approach that can be used in conjunction with microbial population bioinformatics tools to statistically associate diversity variables with building and human health metadata.